[INTRODUCTION] Single port surgery (SPS) has been explosively spreading. SPS is sometimes demanded, and it seems to be more difficult than under conventional laparoscopic surgery. However, there has been no report which evaluate the difficulty of SPS in objective or subjective way, yet. The aim of this study is to assess the difficulty of SPS, using and experimental suturing model in dry box. [MATERIAL AND METHODS] Subjects were divided for 3 groups; 7 experienced laparoscopic surgeons (Group A) and 7 surgical residents (Group B) and 7 interns (Group C). An experimental suturing model is developed and working angle was set from 0 to 90 degrees. Task was specified to be making one stitch and square knot. Subjects performed the intracorporeal suturing task in dry box for three times in each angle;0, 30, 45, 60, and 90 degrees. The completion rate, the execution time, the precision, and the stress in each angle and each group were statistically evaluated. [RESULTS] The completion rate in 0 degree was significantly lower than that in the other angles (p<0.05). There was no significant difference between 30 and 90 degrees (p>0.05). Completion rate of group A was higher than that of the other groups (A: 42.8%, B: 14.2%, C: 0%). There was no significant difference in the execution time of each angles (p>0.05). Group A completed the suturing task significantly shorter than group B and group C in each angle (90 degrees; p=0.002, 60 degrees; p=0.0015, 45 degrees; p=0.0001, 30 degrees; p=0.01, 0 degree; p=0.04). Precision of task in 30 and 45 degrees were significantly higher than that in 0 degree (p=0.018), and there was no significant difference between tasks in 30 and 90°(P>0.05). Precision of task in group A was significantly higher than that of group B and group C in 0, 60, and 90 degrees (90 degrees; p=0.014, 60 degrees; p=0.01, 0 degree; p=0.001). In precision of task in 45 degrees, there is no significant difference between each group (p>0.05). Stress score in 0 degree were significantly higher than that in the other angles (p<005), and there was no significant difference between each group (p>0.05). 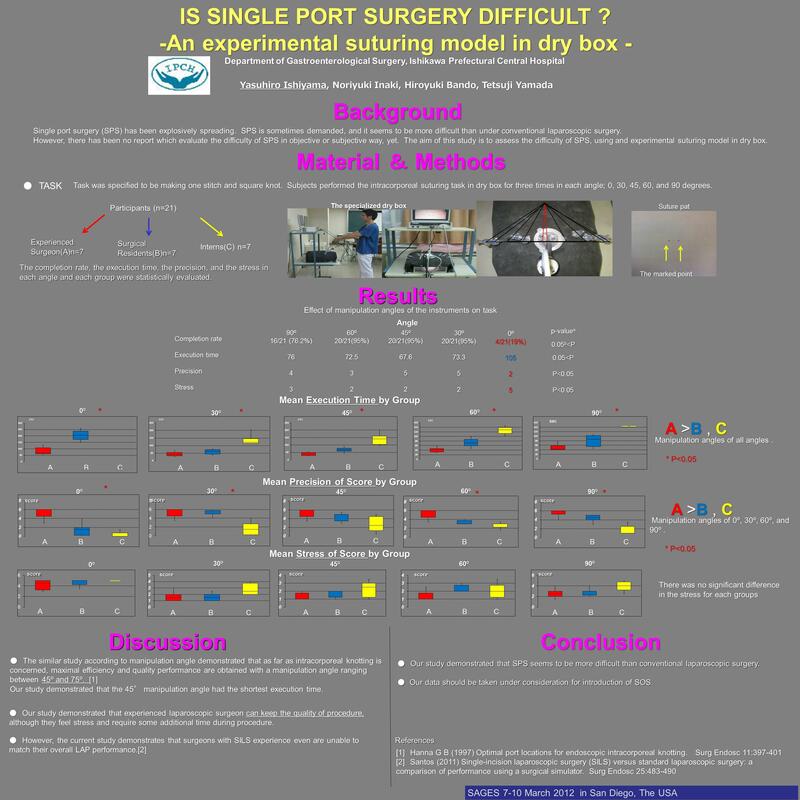 [CONCLUSION] Our study demonstrated that SPS seems to be more difficult than conventional laparoscopic surgery. Experienced laparoscopic surgeon can keep the quality of procedure, although they feel stress during procedure. Our data should be taken under consideration for introduction of SPS.